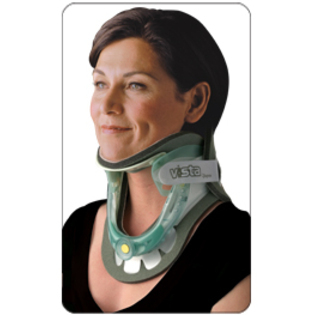 a cervical collar, which can really help with all the symptoms you’re having. “It’s just a cervical collar,” she said. She really said that. 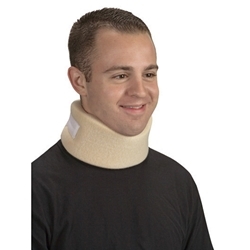 So I pictured the kind a person who has whiplash wears, maybe. It even looks comfortable with all that padding and is only $5.95 at healthykin.com. Now that’s affordable fun! I read a really cool medical literary journal this weekend called Ars Medica; in one graphic story, a social worker counsels her patient to expect the very worst outcome in health situations so that you can be pleasantly surprised when something good (or even marginally better) happens. I probably should have considered this excellent advice before I made an assumption about the cervical collar. The real version is below. Fear not: You will never see me wearing the Aspen Vista device. That is, you won’t see me wearing it, unless you visit me at home, and it turns out to be fantastic. Chiari Malformation is mainly a structural defect in the cerebellum, the part of the brain that controls balance. This defect can result in headaches, fatigue, and muscle weakness in the head and face. From all that can come difficulty swallowing and voice hoarseness. Further are Dysautonomia, that is, exercise intolerance, intolerance to temperature extremes (heat for me), and the related Postural Orthopedic Tachycardia Syndrome(POTS) (a sort of trouble one can have with the rapid contrasts between sitting and standing). This, in other words, is a veritable feces storm of fun. In my experience, my Chiari Malformation symptoms started, of course, with the headaches. The headaches serve as the umbilicus of my ever-cycling Diaspora of symptoms. But, though I was not aware of any of these maladies other than the migraine, Chiari Malformation truly began to distinguish itself from migraine and Ehlers Danlos Syndrome when I was finishing graduate school and still teaching. I would take a shower, getting ready for work, and (not understanding my heat intolerance) as soon as I was done putting the lotion on my legs—or sooner—I felt faint and would have to lie down in bed with a fan blowing on me, while the room spun around. Frequently, by the time I cooled down, my head started to pound like holy hell was going on inside it. Sometimes it took an hour or more for me for me to be able to stand. Ah, hindsight. The more I look back, the more I realize how unnecessary all that stressing out was. I’m so sorry if I was ever short with my coworkers because I had “so much to do.” Who really cared? My Type A personality would rile me to an insane froth. I’d be shouting at myself, “Get up you lazy sloth!” Very helpful. Yet, my mind could not shake the truth that in one hour 27 freshman comp students would be dozing in their seats, and while they were not particularly interested in my class activities, they would raise holy Hell if I didn’t show. It is true that intense pressure applied without release can cause a certain implosion, but I try not to spend too much time worrying that I caused my own aneurysm with stressing out over the way these terrible symptoms were causing me to miss work or work poorly. I realize now that I went about twenty years without taking a deep breath. I’m just learning a week at a time not to bash Heidi. Are you stressing out? What are you stressing out about? If you’re stressing out and yelling at yourself….why? If you knew you had only 284 days left, how would you spend the morning with your coworkers and clients/students? Please, do go to the movies instead of stressing. In fact, go see Albert Nobbs. It’s fantastic.